Ryan Lee was busy revelling in the immediate success of his invention - a high-quality mini speaker that could fill a room with music - when the party was cut short. Six months into production, he started receiving calls from his distributors in Europe, asking for a discount. They had been offered what looked like the exact same speaker at a much cheaper price to the premium Mr Lee's company, Xmi, was charging. That was the moment he realised his brainchild had been ripped off, and he would have to tread much more carefully when it came to manufacturing in China. "We had to learn a lot of hard lessons in China. We had a lot of difficulty," he says. Despite the setback, the X-mini proved a popular product, and last year the company made 33m Singapore dollars ($26m; £17.7m) in revenue. Xmi is based, somewhat unconventionally, in what used to be a bar in Singapore's central business district. The room still has the remnants of its former past - a pool table, black couches and dark corners. When Mr Lee first started selling the X-mini speaker in 2006, the dream was to create a product that would bring big sound in a pocket size. The idea came to him as he listened to the bad sound quality of many of the portable consumer devices hitting the market, such as laptops and game players. "There was no other small speaker that was better than this at the time," he says. "That's why we demanded the premium - customers will pay for quality." And he was right. Despite the high price, the device was immediately successful. But even as it was flying off the shelves, copies were popping up. The cheaper products were made by other companies in China, where it was being manufactured. "They could see that our products are moving in such quantities, there must be large demand for this thing wherever it's selling," he says. The plastic casing of the counterfeit speakers was the same as the X-mini, but without the sound quality. Mr Lee also knew they were fakes because they were missing the company's serial numbers and had different packaging. Such a situation is one of the risks that comes with choosing to manufacture in China, faced by both huge conglomerates and start-ups alike. 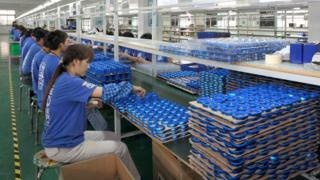 But the allure of China is also great, especially for firms looking to get hi-tech products manufactured. "China is the most competitive country for hardware," says Mr Lee. The country's vast resources, large pool of talented workers and economies of scale have cemented its place at the forefront of global manufacturing. Mr Lee says he considered manufacturing in Indonesia or Vietnam, but China came out on top in terms of cost and quality. "Not everything can be done in these countries, and on top of that they are not even as good at assembly. So you're going to pay more for an inferior product," he says. China has long been lauded for its manufacturing capabilities, but there have also been concerns about intellectual property theft in the country. The fake products, known as Shanzhai, range from knock-offs of high-end luxury brands to everyday electronic goods. According to the US International Trade Commission, American companies in intellectual property-intensive businesses reported losses of approximately $48.2bn (£32bn) in sales, royalties, or licence fees due to infringement in China in 2009. Whye Mun Chan has had to deal with many firms concerned about intellectual property theft in China and the wider region. He is a senior vice-president at Singapore-based manufacturer Sunningdale Tech, which has manufacturing facilities in China, Malaysia and Singapore. Mr Chan says that from a manufacturer's perspective, the temptation can be great to produce more of a customer's product and sell the excess on the black market, a practice many businesses have encountered in China. "The black market is always willing to pay more than the company, because they have no overheads, no marketing costs and no distribution costs," he says. Mr Chan says Sunningdale takes measures, including installing cameras, to ensure there are no information leaks or overproduction at its factories. A reputation for trustworthiness is key for any manufacturer in the region so that customers choose them for large volume orders, he adds. But he says there are steps companies can take to protect themselves. One of Sunningdale's clients, Hewlett-Packard, only supplies them with a certain number of print-heads for the ink cartridges they make for the company. Another measure employed by companies is to split up components among different suppliers and manufacturers, to ensure no one company has all the required parts to sell a complete product. Back at X-mini headquarters, Mr Lee explains that is what he now does, as well as manufacturing some highly sensitive components at his company's own facilities. But the risk is not only from partner manufacturers, but also from those on the outside. Mr Lee says it's very easy for anyone to create a fake that looks like the original - all it needs is the capability to make a plastic moulding of the product. He says the only real way to fight back against the duplicates is to keep improving the product. The life cycle of many hi-tech consumer devices is short, with a better version on the market within months. He thinks the only reason you would fight a legal battle to protect your old ideas is if you don't have any more good new ones. "I'd rather throw my money to the engineers, not to my lawyers," he says. "You innovate faster than your fakes. That's how you play in the technology game."